Dogs have been referred to as man’s best friend for centuries. During that time, dogs were largely used for hunting and protection and in later times dogs became companions to many. A number of dog breeds that we have today are the results of selective breeding for traits with hunting, protection and companionship. For example, I used to raise and train German Shepherds. They were originally bred for hunting, but later became great guard dogs as well. Currently, we have Maltese, a small white breed of dog that was established about 2000 years ago and were bred as a companion dog. During the Middle Ages and Renaissance, Maltese were kept by the ladies of aristocracy as a sign of their status. The women used to carry their Maltese (weighing 4-7 pounds) in the large baggy sleeves of their dresses. According to the American Kennel Club, there are 190 registered dog breeds categorized into 7 main groups. Then there are countless numbers of mixed breeds of dogs, often referred to as mutts. In many homes and places, dogs are truly man’s best friend. Dogs are calming in a number of ways. There have been a number of studies over the years that show that dogs actually help many people live longer. One study I saw a few years ago said that petting a dog for a minimum of 10 minutes a day helps reduce stress and the reduction of stress helps keep us healthier. This is why a growing number of people are turning to dogs as a form of therapy. It’s been found that returning military veterans who suffer from PTSD are helped by having specially trained therapy dogs. The dogs help them deal with the things that cause them stress. To some veterans, their therapy dogs are as important and vital to them as seeing-eye dogs are to blind people. Coping without their dog is extremely difficult. 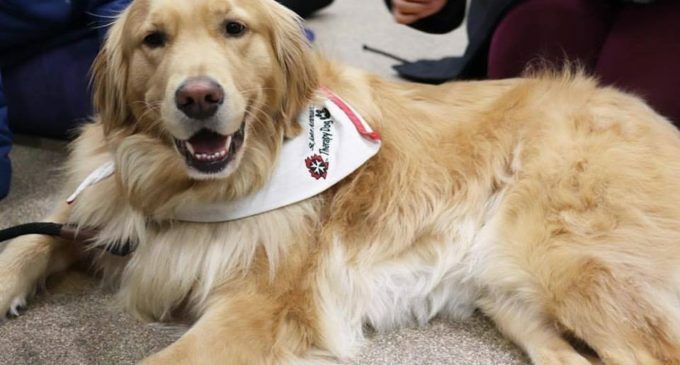 A number of hospitals have turned to therapy dogs to help their patients. Therapy dogs help the elderly and the young patients especially. What kids, healthy or sick, doesn’t perk up when they see a friendly wagging tail? Medical workers will tell you that having therapy dogs come into their hospitals, especially those that treat children, help their patients is so many ways. The use of therapy dogs is increasing in many medical facilities because of the huge benefits they provide. A MRSA infection can be especially dangerous and even deadly for many cancer patients, who already have weakened immune systems due to the treatments they receive. There are antiseptic shampoos that are recommended for use with therapy dogs. Using these shampoos greatly reduces the chance of the dogs passing MRSA on to the patients. It was reported that when therapy dogs are NOT properly cleaned that the kids with cancer had a 6 times greater chance of contracting MRSA. Bottom line, if you have a therapy dog, take the added precaution of washing your dog with an antiseptic shampoo before taking him/her to help cheer up anyone in a hospital or nursing home, but don’t let the threat of MRSA stop you from helping those who desperately need the love your dog can give them. Why Is High Blood Pressure More Common in Southeastern US?